And then there were four! It’s down to the semi-finals at the Irish Women’s Close at Enniscrone this morning with the final being played this afternoon and Sara Byrne (Douglas), Sarah Cunningham, Louise Coffey (Malone) and Meadhbh Doyle (Portarlington) are the final four standing. Yesterday saw the decider for the Ita Wallace Trophy (Plate) which went to deserving winner Leah Temple Lang (Elm Park) defeating Una Marsden (Tullamore), Anna Foster (Elm Park), Mary Doyle (The Heath) and Elisa Corcoran (Grange) she clinched the second flight, adding to her Plate victory at the Irish Girls’ Close Championship in Mallow last year. Five of the second round Championship matches needed at least 18 holes to be decided and despite a strong start to her tournament, leading qualifier Valerie Clancy (Killarney) was defeated by Maynooth University Scholar Molly Dowling on the 17th. 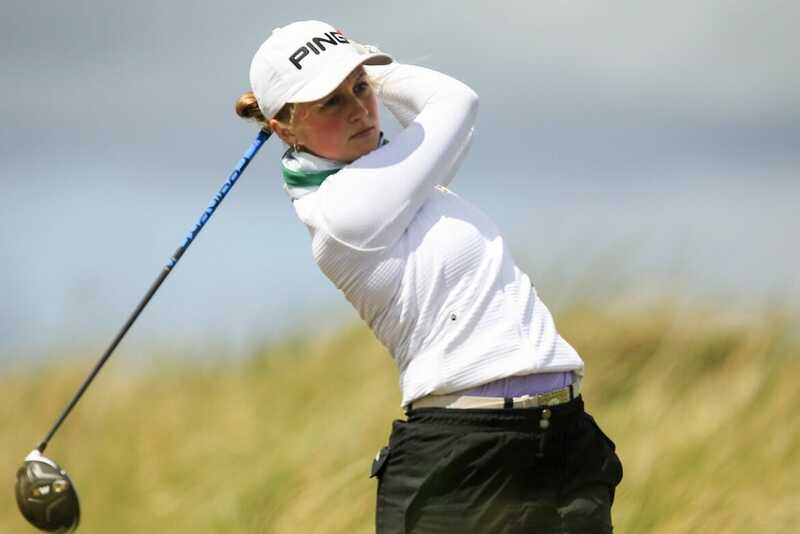 Dowling went on to face Girls’ International Sara Byrne (Douglas) in the quarter-final who needed 19 holes to decide her tie with Lucy Simpson (Royal Portrush) earlier in the day. The 17-year-old continued her run of form and having got the better of Dowling, now finds herself in her first Irish Women’s Close Semi-Final. The experience of Deirdre Smith (Co. Louth), Sarah Cunningham (Ennis) and Louise Coffey prevailed on the difficult links as they saw off Sinead Sexton (Lahinch), Kate Dwyer (Rossmore) and Jessica Ross (Clandeboye) in the morning matches. While Coffey cruised to victory over Eleanor Metcalfe (Laytown & Bettystown) in the quarter-final, Cunningham’s streak of 4 holes won in the middle of the round was too much for Smith to come back from and the Clare woman finished the match 2&1. Meadhbh Doyle (Portarlington) and Shannon Burke (Ballinrobe), who are past Maynooth University teammates, were the 4th match to reach the 18th this morning while the match between Aine Donegan (Woodstock) and Maeve Cummins (Lurgan) followed shortly after. Both Doyle and Donegan prevailed meaning they would face each other in the quarter-final. Doyle found herself with a 2 hole advantage after 9 holes and by the 13th she had doubled her lead – a deficit too much to fight back from and the match was won 5&4 by Doyle. Meanwhile Leah Temple Lang (Elm Park) was the strongest challenger in the Ita Wallace Trophy (Plate). Defeating Una Marsden (Tullamore), Anna Foster (Elm Park), Mary Doyle (The Heath) and Elisa Corcoran (Grange) she clinched the second flight, adding to her Plate victory at the Irish Girls’ Close Championship in Mallow last year.